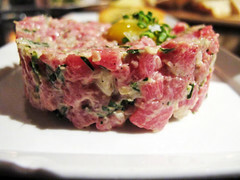 Paolo’s Trattoria | Charlestown | Just Add Cheese! Charlestown, I owe you an apology. I’m sorry that I’ve ignored you for the past five years. While I’ve been running around Boston eating and drinking at every establishment I see, you’ve been here the whole time, steps from the North End and Cambridge, easily accessible by the orange line and multiple bus routes, remaining unexplored and undiscovered. You are the home to the infamous battle of Bunker Hill for god’s sake! I’m not a history buff by any means, but this is a serious claim to fame. Again, I’m sorry for my nonsense Charlestown, you deserve better. Our friend Megan recently relocated to said Charlestown. When a relocation occurs, two important things must happen: we check out the crib and we eat in the new hood. Last Thursday Jacki and I did just that. Driving through Charlestown, I was in awe of the cuteness. It’s a small neighborhood with narrow and curvy streets, a central square, pretty street lamps, brownstones, and a ton of restaurants and shops. After checking out Megan’s new apartment, (which was beautiful, centrally located and so adult-like! ), we walked to Paolo’s Trattoria, a tiny Italian restaurant on Main Street. Paolo’s ended up being the perfect spot for a weekday dinner. As we walked in, I could tell it was going to be a good experience. Everyone seemed to be regulars, it was dimly lit, which was nice, and the atmosphere was very positive. The service was attentive from the get-go, our waitress greeted us and gave us awesome bread, and the food was authentic and exceeded expectations. 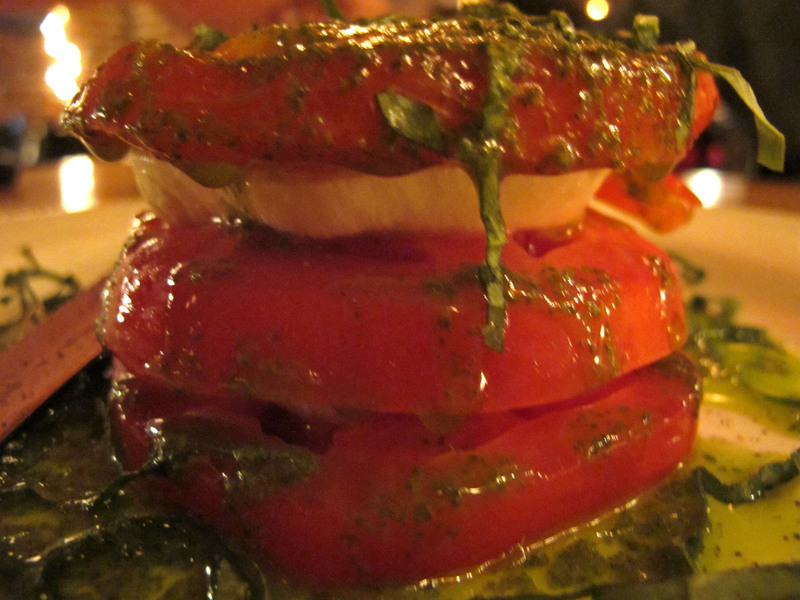 We started with a caprese salad. It was served skyscraper-style, dripping with oil and basil. We loved it. For our entrees, we all decided on pasta. The menu also had pizza and other meat and fish entrees, but the pasta just looked so good. 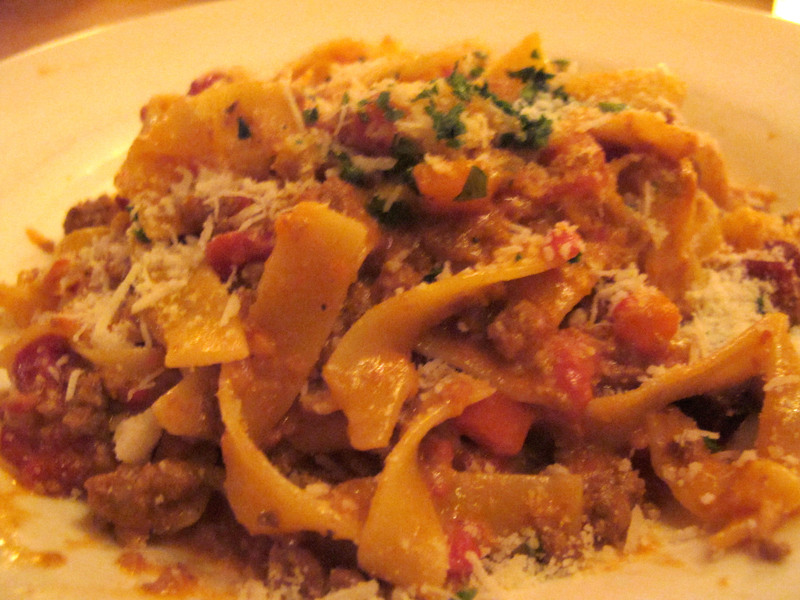 I got the Tagliatelle alla Bolognese. It was exactly how Bolognese should be, the pasta was cooked to a perfect al dente and the sauce was meaty and flavorful! Paolo’s piled on the sauce, which I love – sometimes restaurants can commit the cardinal sin of being stingy with the Bolognese. 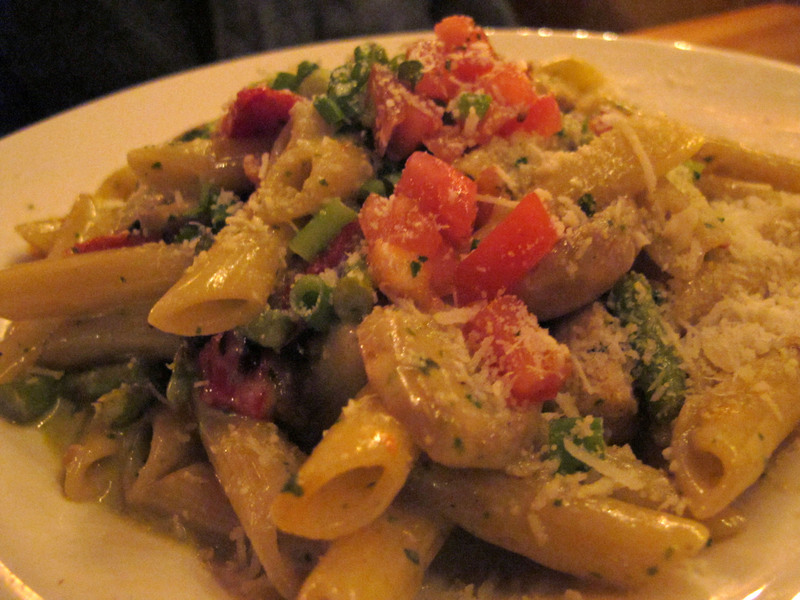 Jacki ordered the Penne con Pollo (medallions of chicken with asparagus, mushrooms, sweet onions, sun-dried tomatoes, pesto cream sauce, penne pasta). This was also perfect, the pesto cream sauce was awesome and it was LOADED with veggies. 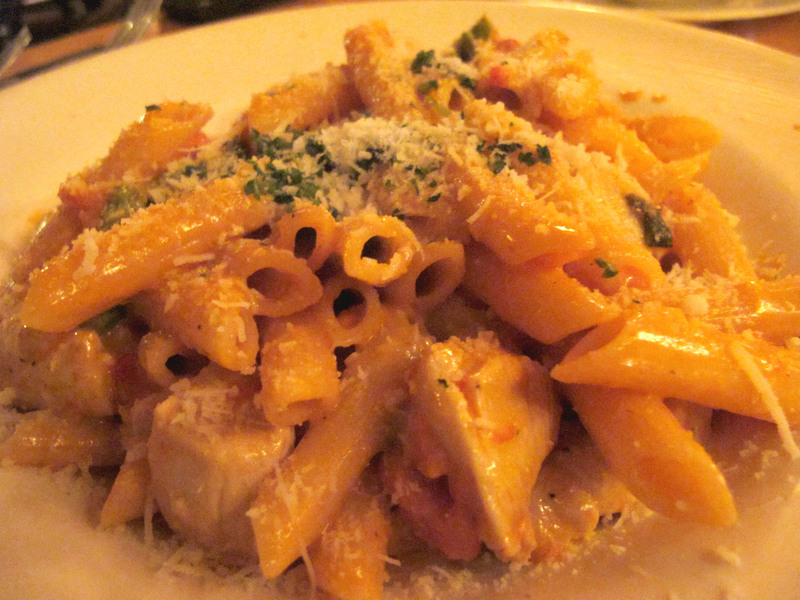 and Megan ordered a special, Penne alla Vodka with Chicken, another great dish. The vodka sauce was the perfect amount of creamy, which is good because too much cream can lead to an early food coma. All three dishes were excellent. Kudos on the pasta to sauce ratios. We were going to split them three-ways but ended up liking our own the best. The portions were huge and a great value for the price, and the service was top notch. Overall assessment: Paolo’s is amazing. We loved every second of it. Just Add Cheese rating (if we had a 5 point rating system, which we may have to implement sometime in the near future): 5 out of 5! This entry was posted in Boston, Charlestown, Cheese, Dining Out, Hidden Gem, Italian and tagged bolognese, Boston, caprese, charlestown, dining out, hidden gem, italian, mozzarella, neighborhood, paolos, pasta, penne alla vodka, restaurants, tomato. Bookmark the permalink.